ONLY VISIBLE WHEN in use. SWITCHing LIGHT WORKS in both positions. IT CAN BE RETROFITTED TO A LIGHT SWITCH. BEHIND ALMOST EVERY CONVENTIONALLY INSTALLED LIGHT SWITCH HIDES A SOCKET outlet. NOW THE HIDDEN SOCKET MAKES THIS DOUBLE FUNCTION POSSIBLE - even AS A RETROFIT ON EXISTING SWITCHES! In order to trigger the mechanical opening support, a slight pressure is sufficient and the switch automatically moves upwards. To close, simply push the switch back down to the locking position. The Hidden Socket has an integrated locking mechanism. This can be used with a magnetic key in order to restrict the use of the socket or to ensure protection for children. The light switch of the Hidden Socket utilizes Hue radio technology. As an equally battery-free wireless switch, it is also integrated into the Hue Bridge. The Hidden Socket light switch takes over lighting control in the Smart Home. The combination of a miniaturized energy converter and energy-efficient wireless technology enables a maintenance-free wireless switch without batteries. The Hidden Socket can be extended below with a cradle. A mobile device can be stored here and the charging function can be used together with the USB socket and the charging cable. THE HIDDEN SOCKET ENABLES THE RETROFITTING OF ADDITIONAL SOCKETS UNDER EXISTING LIGHT SWITCHES AND THE RETROFITTING OF ADDITIONAL LIGHT SWITCHES ON EXISTING SOCKETS. 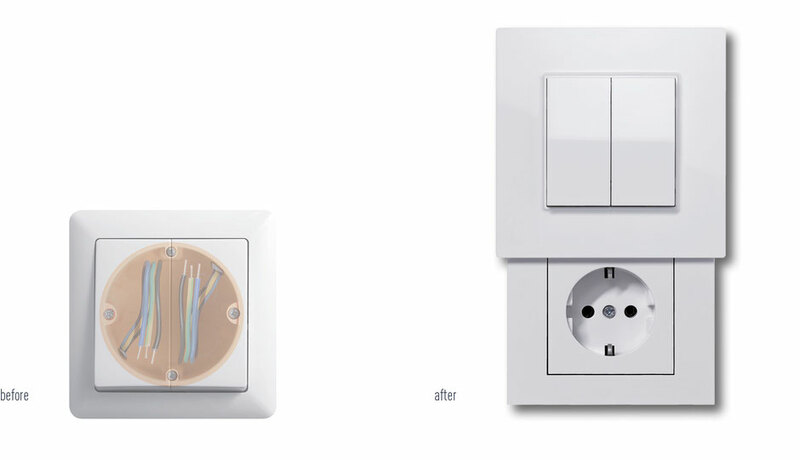 What you need for the installation of the Hidden Socket is usually available with light switches and sockets: they are installed on a flush-mounted socket in which a 230 V power cable is connected. Replacing existing sockets with hidden sockets is even easier - they can be easily exchanged for each other. For retrofitting, the old light switch should be installed on a flush-mounted box. The depth of the flush-mounted box should be 47 mm for the simple Hidden Socket and 61 mm for the charging version with 2-fold USB. Furthermore, a 230 V power cable should be available in the flush-mounted box. If the previous light switch is wired in the way shown above, it can simply be replaced with an Hidden Socket. The Friends of Hue Switch offers a light switch that covers the hidden socket and releases it via push-to-open. The Switch has all switching functions of the Hue Tap and is also battery and maintenance free. With the magnetic key as a separate accessory, access to the hidden socket can also be locked or unlocked. In the Friends of Hue Switch with additional charging function, the light switch and a hidden socket with two USB charging sockets are extended by a charging cradle below. Also included is a multi-USB charging cable with three connector formats so that all mobile devices can be charged. Here, too, access to the hidden socket can be locked or unlocked with the magnetic key as a separate accessory. The version Tap Dock offers a dock for your Hue Tap. Once inserted, the movable Tap Dock covers the hidden socket and releases it via push-to-open if required. Access to the hidden socket can also be locked or unlocked using the magnetic key as a separate accessory. The Tap Dock is also available with a hidden socket with two USB charging sockets and a charging cradle below. A charging cable with three plug formats is also included so that any mobile devices can be charged. In addition to doors, the Hidden Socket can replace an existing light switch in order to use it temporarily at a convenient operating height, e.g. for vacuum cleaning. This operation without bending down is particularly convenient for older people. The Hidden Socket is a matter of design. For temporary use, the Hidden Socket can be retrofitted with a socket outlet under the existing light switch. The advantage here is that this socket is discreet and is aesthetically covered by the light switch and only visible if necessary. With the +Charge version, each socket can be extended by a charging function. Simply move the switch upwards, plug the charging cable into the USB socket and the mobile device and place it in the shelf below. In the bedroom it is worth retrofitting a hidden socket light switch on the existing socket if the light is also to be switched comfortably at the bedside. To protect children from electric shock, the Hidden Socket can be magnetically locked. The locking function can only be released with the magnetic key. With a simple lockable cover (without a switch or Tap), lockable service sockets can be installed in the public space of e.g. kindergartens, schools or offices, which can only be opened and used by service staff such as caretakers or cleaning personnel using a magnetic key. Hidden Socket was patented because of its innovative details under EPA-No. 3079209. Die Versteckdose™ ist eine Marke der TCS AG. Hidden socket a brand of TCS.